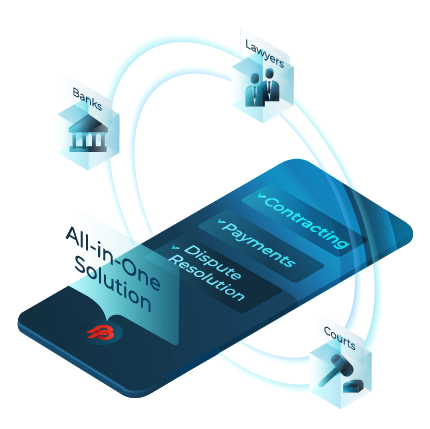 PrepayWay Global Trade is an integrated blockchain solution for fast, secure and convenient international business contracting, from creation to execution. Leveraging self-executing smart contracts and decentralized storage of transaction data, it replaces the traditional paper- and trust-based system with a fully digital alternative. PrepayWay Global Trade automates contracting and payment processes, reduces transaction costs, and increases transparency, traceability, and efficiency of cross-border transactions in a wide range of industries. The average cost to businesses of processing and reviewing a basic everyday contract has increased 38% (source: blog.iaccm.com) over the course of the last decade. Substantial costs are incurred due to the involvement of multiple individuals in ironing out the contract details on every contract stage, from creation and review to negotiation and signature. PrepayWay provides standardized yet customizable legal and enforceable contract templates prepared by legal experts and translated into multiple languages. The high level of standardization in combination with the modular architecture of contract documents allows contracts to be readily customized to the negotiated, transaction-specific needs of individual clients. PrepayWay contract service lowers the time and money spent on lawyering transactions. Contracts can be easily created, negotiated, and digitally signed on our online platform, recorded as smart contracts on the blockchain, and easily referenced along with other transaction details. The information flow in international trade is highly complicated. Movement of goods and services involves a series of paper-based performance confirmations by multiple parties. Financial, transportation, insurance, and storage companies all rely on trust between parties, validated by paper trails and handwritten signatures. Even the smallest typos and errors can lead to substantial delays, financial damage, and, in case of time-sensitive products, total loss of shipment value. PrepayWay smart contract solution replaces this obsolete document workflow environment with automated contracting processes and tamper-proof digital record-keeping, thereby reducing error rate and bureaucracy and eliminating much of the paperwork inherent in traditional workflows. PrepayWay blockchain solutions enable data transparency and access to information for all the involved stakeholders, thereby enhancing trust and creating error-free flows of goods and services. The result – accelerated speed of transactions, dramatically reduced transaction costs, and minimized risk of fraud. While most partners enter in a contractual agreement with the best intentions, disputes do happen and can have serious consequences. Even petty cases damage relationships and reputations and consume enormous amounts of time and money. Apart from lawyers’ fees and other direct costs, the less apparent but equally important indirect costs of disputes are those of diverting personnel from productive activities and of destroying a profitable relationship with a former business partner. The risk of the breach of a smart contract is reduced: smart contracts self-execute automatically only if terms and conditions are met. Thus, the frequency of disputes is significantly reduced. Not only does PrepayWay minimize the conditions which lead to disputes, but it also offers time- and cost-efficient smart dispute resolution services instead of lengthy litigation. PrepayWay Global Trade employs smart contracts that use the SmartArb mediation and arbitration clause in code form to add a layer of security to any smart contract to ensure that disputes will be resolved quickly and fairly. SmartArb encompasses a network of independent certified experts in international mediation and arbitration and provides a tiered system of fair, efficient, and reliable dispute-resolution services for businesses worldwide.